The road to the front gate of the Yaami Hotel (也阿弥ホテル) at Maruyama (円山) in Higashiyama, Kyoto. In 1879 (Meiji 12) Nagasaki businessman Mankichi Inoue (井上万吉, 1835-??) bought several temple buildings in Kyoto’s Higashiyama district and converted them into a hotel, the first Western-style hotel in Kyoto. Together with the Kyoto Hotel, the Yaami was Kyoto’s premier destination for foreigners and well-to-do Japanese. 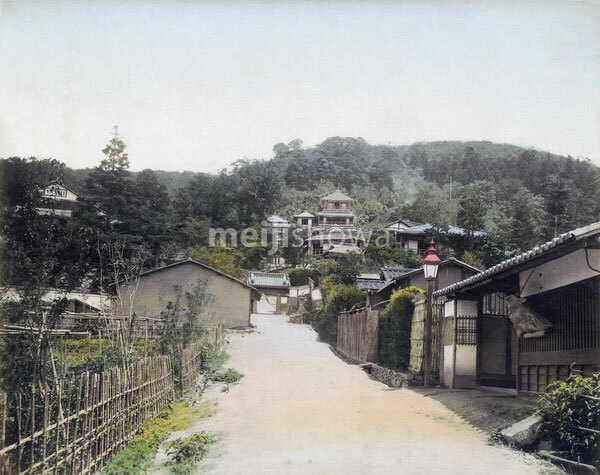 The building burned down in 1906 (Meiji 39).